When specifying electrical connectors in a design, considerations have to be given to how and where the end product will be employed. Variables such as heat, vibration or other harsh treatment need to be addressed to maintain reliability. 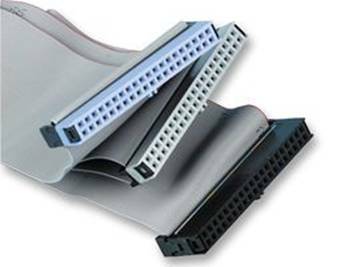 The most common ways to achieve quality connections is through the use of IDC connectors when employing flat ribbon cable or crimp connectors where individual cable connections are required. IDC connectors (Insulation Displacement Connectors) offer benefits of efficiency as well as strength. The mass termination possible on flat cables lends itself to speedy manufacture, particularly in the harness assembly operation, removing the need to strip, solder and crimp each wire individually. The insulation is displaced by inbuilt piercing blades during the connection process and the connector can accept both solid and multi-strand wire. They can also strip aside any surface oxides to achieve a good metal to metal connection. With the ability to withstand significant ranges of temperature and shock, IDC connectors have a versatile range of applications. One piece solutions with integral clamping strip reduce cost further without compromising continuity. The critical factor in crimping is that a proper cold welded crimp has to be achieved. The wire is not simply “crushed together” with the crimp. Properly accomplished it will result in a high electrically performing and long lasting termination; a good cold weld is considered to be preferable to solder. Using improperly sized wires and connectors will result in poor electrical performance as well as poor mechanical strength with no cold welding of materials. Besides matching the connector with the wire or cable, proper tooling is also absolutely necessary for a proper crimp termination. Crimp housings reduce stress on the connection but can be disregarded if space is an issue. In both types of termination, the connection must be considered gas-tight to prevent oxidisation occurring and degrading the metal wire. In IDC connectors, this is easily achieved. Crimping with a little manual skill can also accomplish the same result. A pull test on a crimp connection will also reveal the strength; if a break occurs, it should be noted at which point this happens. If it is with the connector itself, the crimp has been poorly executed or the wrong size employed. Contact us for advice on your project.